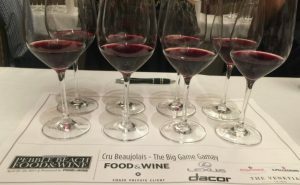 Such was the case with the panel at Pebble Beach Food and Wine this season, featuring a discussion on Gamay from Beaujolais France (where it thrives) a region located south of Burgundy. The lively group featured Master Sommeliers, David Keck and June Rodil, Penfold’s Ambassador and Best Dressed Sommelier D’Lynn Proctor and Wine Expert Anthony Giglio. With jokes that were entertaining and educational, there was no dull moment in this session on Beaujolais Gamay. Probably the most memorable moment was by David Keck. His impromptu riff of an aria sealed the experience. Our focus is on cru. Cru is most often reserved for those vineyards of superior quality. So when we say crus in this piece we are talking more than one top quality Beaujolais. The big challenge about Beaujolais today is overcoming the scene set by Beaujolais Nouveau. Nouveau is made by carbonic maceration. That means you take all of your grapes, through them in a vat and pump in a bunch of carbon dioxide cutting off the access to oxygen to begin a normal fermentation. It’s a totally different chemical reaction than traditional fermentation. This invokes a lot of bright floral characteristics quickly and makes it ready to drink in a month or so. You’d better drink it fast because it has an incredibly short shelf life span. Getting into more specific aspects of crus (the villages of northern Beaujolais), there are 10 crus of Beaujolais. This is where the spectacular Gamay comes from. 100% goodness from the grape that almost disappeared from existence in the region. 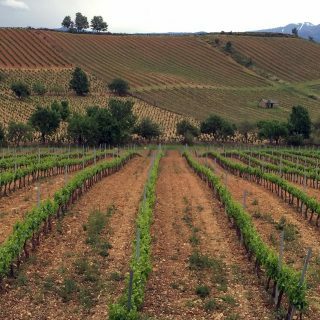 The soils are almost exclusively grown in granite and schist (crumbling rock) based soils. This is the best of the best. The 10 crus are found in the following villages: Brouilly, Chenas, Chiroubles, Cote de Brouilly, Fleurie, Julienas, Morgon, Moulin-a-Vent, Regin, Saint Amore, and Beaujolais-Villages. These wines are unique in personality, compelling because of the region and vastly different from one and other. If you want to get a wine geek excited this is where you should be looking for wine. Fleurie is a pretty awesome place. There are a lot of really cool vines coming out of there. Pink granite soils. You can get an amazing Beaujolais for a fraction of what you might pay for any other comparable wine and for that Beaujolais deserves your attention. The bulk of these wines ranges from $20 – $40 a bottle. The values of these Gamay Beaujolais are exceptional. The highest amount of complexity and deliciousness for the lowest amount of investment in the red wine world. Giglio is from an Italian American family that drank wine out of the fridge. Giglio’s witty, unpretentious style can be discerned in the weekly “Wine Rant” column he writes for FOOD & WINE Magazine. Anthony is also the Wine Director for The Centurion Lounge, a network of premium airport lounges by American Express. Giglio has written 11 books, including the annual FOOD & WINE Wine Guide, the enormously popular Mr. Boston Official Bartender’s Guide, Cocktails in New York, and Passport to Italian Wine. This pretty much sums it up (below). He most recently created The Camerata at Paulie’s wine bar which rose to national and international acclaim. 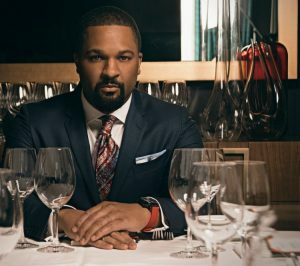 One of Food and Wine magazine’s Sommeliers of the Year in 2016 and one of only 149 Master Sommeliers in the country, he has recently co-founded Goodnight Hospitality in Houston, TX, and is working on several new projects to open in 2017 and 2018.
sales, fine and rare wine brokerage, and international education. 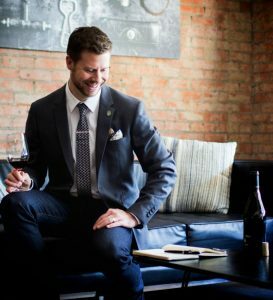 He is known as the most beautifully dressed Sommelier. One panelist was unable to participate. I can tell you she is delightful, entertaining and the 7th Master Sommelier in Texas. June Rodil, MS since 2015 is with Macguire Norman Hospitality. 1) Why Beaujolais Gamay? What is your favorite go-to bottle? I love these Gamay-based wines made at the source. And I’ll take it further and say that I’m talking exclusively about Beaujolais from the 10 Crus I discussed in my seminar at PBFW. My go-to bottle, if I could get my hands on it regularly, would be 2014 Jean Foillard Morgon Cote de Py. It’s aromatic, with pronounced minerality, bright cherry fruit and a suppleness that I just love. Drinking Gamay from Beaujolais, you can still tell why Beaujolais is where the grape still sees it’s most delicious expression, but there are some producers in the Loire valley that are making amazing wine and some terrific Gamay from the United States as well. So many great producers, but I often find myself going back to one of the standard-bearers: Lapierre. Definitely Cru Beaujolais, Chenas personally, but that doesn’t mean I don’t enjoy other examples of Gamay from around the world. 2) The synergy between the four of you at Pebble Beach was amazing. What are some of the most intriguing aspects of one or more of the other Somms that added to this? June brought youth and quick-witted smarty-pants sass. She and I hosted the Ceretto tasting the next day and laughed just as hard. David brought a commanding-yet-self-deprecating voice and perfectly deadpan timing. And he sang a French opera for us and brought the audience to its feet! D’Lynn is the smooth operator who oozes charm, brains and elan. And he’s always the best dressed person in the room. Honestly I think it has more to do with the fact that we all actually really enjoy what we do, so the energy from everyone was so positive and happy to talk about a bunch of really delicious wines. The gorgeous element of all making a name for ourselves in Texas. Dallas, Austin, Houston respectively. Of course the New Yorker Anthony G, has such a magnetic way of telling hilarious stories spun with classic producers, that younger consumers like to hear. 3) You hail from (fill in the blank). What is the best thing about your local wine scene? I hail from Jersey City. You got a problem with that (cue the drums: bah duhm, duhm)? I usually start off most presentations with that line because it sets the bar at a certain level, depending on the crowd. Obviously, Jersey is a punch line for so many misguided, narrow-minded, pretentious idiots, so when I show up with my fancy pants credentials and then tell everyone that I grew up drinking wine at my grandparents’ table in their basement apartment in lovely Jersey City, it makes some people laugh, some people cringe, and most people relieved that I’m not a snooty Francophile sommelier. I went to college in Manhattan (Go, Fordham! ), and I’ve worked “in the city” for the past 30 years (my current office is in Chelsea). But I’ve weathered the fall and rise of my hometown, just across the Hudson, and am thrilled that it is now on fire with great restaurants and wine bars popping up all over the place. I would challenge anyone who really, really knows great pizza to not count chef Dan Richer’s Razza Pizza Artigianale among the best — anywhere. Houston is so exciting right now– not only is it vibrant and full of amazing sommeliers, but there’s still so much room to grow. Instead of it being an intense competitive city with everyone out to get each other, the community is actually extremely supportive and we’re all just trying to make Houston a better place to drink wine every year. Proctor: I hail from Dallas, currently Napa. The best thing about Dallas right now is Sixty Vines Wine + Dine. A few good friends that are former colleagues run and operate it. The best thing about Napa is the close sommelier community and Cadet Wine Bar(offering a different ‘Vintner as a Bartender’ on Wednesdays). 4) What is the most exciting aspect of being in the wine industry today? I consider myself truly fortunate for having hit the wine wave in this country pretty much at the beginning. When I studied to be a sommelier in 1991 with the Sommelier Society of America (in Manhattan), under the tutelage of the amazing Roger Dagorn, I seemed to be the youngest in the class by 20 years. It seemed as if nobody in their 20s cared about wine, or at least serious, un-sweetened wine. 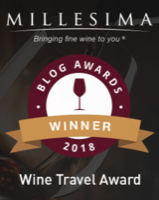 The popularity of wine, and with it the steady rise of its quality at all price levels, has been amazing to watch, and I’m thrilled to be a part of this industry, as a journalist, author, speaker/teacher—and all-around cheerleader. Despite being such an ancient beverage and profession, things continue to change rapidly and it’s fun to see the industry progressing and growing and improving so much all the time. The ability to globally present and reach every member of Trade(somms, wine directors, hoteliers, and students), as well as working with key stake-holders like distributors, selling them Penfolds and teaching students about not only Australia, but Beaujolais, Italy, and every other wine trending in the world. See No. 4. And also know that I’m a journalist first who got amazing advice from my first editor at a finance magazine – her name was Dora Hatras – who told me that I should be writing about wine. I told her she was nuts. But soon after that I read an article in Details magazine about great careers for guys, and one was, “Become a wine expert, meet chicks!” The guy who wrote it studied at the Sommelier Society of America. So, I signed up, and Dora covered me every Tuesday when I took off from so that I could get my diploma. From there I landed a gig as Managing Editor at Wine Enthusiast, when the magazine was just getting started. From there it’s been one great gig after another. Today, I’m a Contributing Editor to Food & Wine, write regularly for Departures, and am the Wine Director for American Express’s Centurion Lounges (in airports all over the place). I started working in a little Irish Pub when I turned 18 in Vermont. 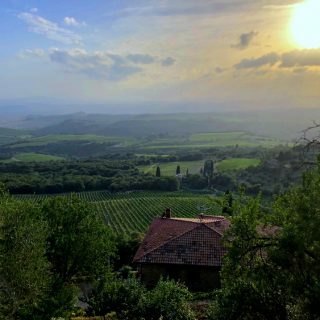 I spent some time in Northern Italy & London after waiting tables, and quickly knew I wanted to be a wine steward and winemaker. I worked, saved money, traveled, and started taking exams and entering competitions, all while becoming a GM and producing wines at an early age. 6) What advice do you have for people when they are out dining and run across a wine list they are completely unfamiliar with? Simple: Ask the waiter to send over the wine director, sommelier or anyone who might know a little bit about wine. But it’s probably not the waiter, because it’s not their job to know wine, unless they work in a really great restaurant. Then, tell that person what you typically like to drink, how much you’d like to spend, and that you’re (hopefully) willing to be adventurous. If you’re in a restaurant with a sommelier or beverage director, then ask for him or her and begin the conversation. You’ll know within a sentence or two whether you’re on the same page and can sort something out together. If not, then pick a region that are familiar with and take a leap! Not being afraid to ask questions, nor mispronouncing producers or varieties. Give your somm or server a few key buzz words to get the conversation going. The dialogue leads to discovery and ultimately a happy diner. 7) What is the most intriguing thing you experienced at Pebble Beach Food and Wine? I’m always intrigued to see what the sommeliers are excited about backstage; that’s what makes Pebble Beach Food & Wine so exceptional: They attract all of these amazing sommeliers from all around the country to pour wines at the various events as part of this huge army of professionals. Backstage, they’re all tasting hundreds of bottles that are being poured in the seminars being conducted all day. Would have to be sitting on panels with some of my favorite people– getting to hear some of the most brilliant wine professionals in the world talk about amazing wines was just outstanding. I found myself just sitting back and listening as much as I could in the hope of just absorbing everything. You can learn more about the Lexus Pebble Beach Food and Wine events here.